Park Bong Pal (Ok Taec Yeon) has grown up with the ability to see ghosts and uses it to work as an exorcist, banishing weak ghosts, in order to make enough money for an operation. 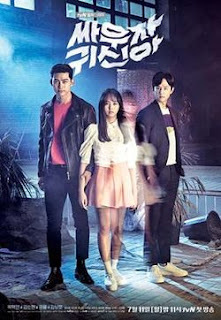 Called to a haunted school he encounters Kim Hyun Ji (Kim So Hyun) a high school student who, because of a traffic accident, became a wandering spirit, on the day before her college entrance exams. Hyun Ji discovers that Bong Pal holds the secret as to why she is a spirit. In order to be freed from endlessly wandering the earth as a ghost and to ascend to the next life, Hyun Ji convinces Bong Pal to allow her to live with him, and the two become ghost fighting partners. I loved this drama more than I thought I would, it was such a pleasant surprise! While watching, it kept reminding me of "Oh My Ghost" and "The Master's Sun". However, don't worry, it's not meant in a negative way. It just has the same vibe. Also, so far Tvn's dramas have never disappointed me yet. So, neither has this one. The story went smoothly, and I liked the exorcism aspect of it, stuff like that scares me easily and this were no joke, but somehow they kept a light feeling over the drama, so it became very enjoyable. As for the acting Teac Yeon was solid, convincing and also charming at some points. The fights were really good, enjoyable and even funny. They did a pretty good job on those. The chemistry between the leads were suprisingly okay. Kim So Hyun is starting to make a really good actress, and I’m looking forward to see her next project. All in all, a recommendable drama. First of all, I am being VERY generous of the rating – just FYI. This drama is cute, though I kind of felt the love story became unnecessary later on – as well as the entire ‘revelation’ about the lead actress: way too typical. When you watch a ghost story drama, you better have a good and firm story EXPECIALLY with love story, but this was like, I don’t know… neither. I can’t say I didn’t enjoy the drama, I just was left with yawn at the end – I mean, it WAS predictable. Taec and Soo Hyun are an odd pair, even though they look okay together, and Taec looks a lot like a college student, I felt Soo Hyun was a bit off – maybe because I keep seeing her as a kid? She is one of those kid actresses that is in almost every drama, and suddenly she becomes an actress with her own drama – and you can’t shake that ‘kid persona’ off her. Well at least I can’t. So the romance was good, but sometimes just off. Taec is quite good in this, though he is a better actor than this drama gives him credit for/lets him shine. As a comedy the comic relief was with the two fellas from the supernatural club: they occasionally missed, but when they hit, I laughed quite a bit. So all in all: a good drama, with a weak plot.